After Activision dropped the James Bond videogame license in January 2013, there were two years of speculation among gamers where 007 would land. Without much fanfare, Glu Mobile snapped up the rights and went about creating a mobile exclusive game 'James Bond World of Espionage' which was rolled out in the Apple App Store and Google Play Store in July 2015. The game was universally panned by reviewers and received a critical mauling. One reviewer compared the gaming experience to a glorified PowerPoint presentation with players having just one button to drive, fight, shoot, gamble, etc. The outcomes were almost random and players had to level up their skills or buy one of the many In-App Purchases (IAP) to keep the games going longer as each click of that same button depleted your health bar. James Bond wasn't even involved in any of the action, as the combatants in the game were stock photo models managed by a card system. Another reviewer likened the experience to a low budget MI6 Halloween costume party. No likeness from the film series appeared other than the same still of Daniel Craig from 'Skyfall' on the menu screens. 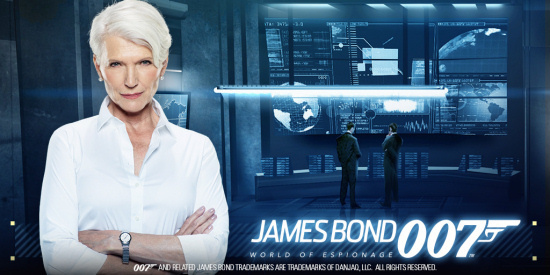 When you don't have the rights to use Judi Dench, just Photoshop in any old lady with white hair in a blouse. Nobody will notice. In the traditional physical model of videogames, when sales start to stall production is slowed until the point where no more discs or cartridges are produced. Not so with mobile games in app stores, where players may still be lingering and expecting new content for their IAP. There has been no fresh content for the title since November 2015. Glu Mobile decided enough was enough and will be pulling the plug on the game's servers on December 20th. The title has already been removed from app stores so it's too late if you never experienced this terrible game first hand. The only real winner from this sorry debacle may have been MGM Interactive. The commercial release of the game triggered the vesting of 1,000,000 Glu shares to MGM Interactive at an exercise price of $3.00 per share, exercisable only for cash. At the time of release, Glu Mobile stock was trading a little above $4, meaning MGM could have made around $1m from buying 1 million shares at $3 and immediately selling them for around $4 on the stock exchange. But Glu Mobile shares are currently trading at $2.12, so if MGM did not immediately divest, they could also be underwater on their stock today.